OK, now. 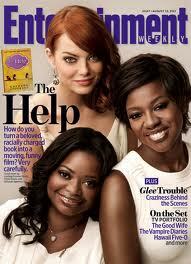 So, The Help opened solidly–$25.5 million over the weekend, $35.4 since Wednesday. Time magazine had perhaps the most unfortunate headline of this news: Apes Fight Off the Help. The prequel to Planet of the Apes just bested –at 27.5m–the film about Black domestic workers in the pre-civil rights South. And it was the South that gave the film its biggest support–places like Memphis, Atlanta, Dallas, and Jackson, Mississippi, the locale of the (allegedly fictional) story. …The Help distorts, ignores, and trivializes the experiences of black domestic workers. We are specifically concerned about the representations of black life and the lack of attention given to sexual harassment and civil rights activism. The controversy surrounding the film makes clear how fundamentally important media is, no matter how small or large. And I’ve begun to believe that The Help is too frail a project to carry the weight of emotions that have erupted around it. Secondly, let’s take seriously our own roles in film, television, online, publishing by supporting the positive projects and boycotting the negative ones…no matter who makes them. That means showing up on opening night for films and using our social networking tools to bring other folks to the theater. And it means aggregating responses to networks and film studios in a prompt, consistent manner. The stakes are too high to let the energy unleashed by this one small movie (alright, and one big book) dissipate.